I love to drive. Mention road trip and I’m the first to volunteer. So the prospect of a self-driving car is not appealing to me in the least. However, I can see the great applications for cars that take care of the driving for you, and perhaps at some point in my life may take advantage of what they offer. What they offer is choice in much the same way that using technology is a choice for our customers. Just because we build it doesn’t mean they’ll come. When voice response and natural language were introduced, contact centers expected big drops in calls going to agents, and when the web and mobile came into play, everyone assumed call volume would peter away. What’s the reason for the contact – to place an order, share feedback, or dispute a bill? For complaints or disputes, voice is the first choice for more than half of consumers who want to speak with someone directly. Email gets the nod for sharing feedback for most, and placing an order is increasingly becoming an omnichannel adventure. Tasks that are more time critical, like placing a wire transfer, for example, drive consumers to real-time voice contact or a visit to the bank. But if I’m paying bills or checking my balance, I’m more likely to use a web-based or mobile app. The more complex the task, the more likely consumers will opt to speak with someone, whether face to face or on the phone. We generally use self-service for simpler tasks, like checking flight status or making a flight reservation. How I connect with a company also depends on whether I’m at work, at home, on a train, or in a crowded shopping mall. People aren’t as willing to select a voice channel in a public place where others can overhear confidential information. Once a consumer is burned on a channel, they may abandon it – or take their business to the competition. That is why common experiences across channels and easy to use interfaces are critical to customer service success. How has channel use shifted? Given the explosion of channels available to consumers, you’d think that we’d see a dramatic reduction in more traditional channels over the past few years. We have not. 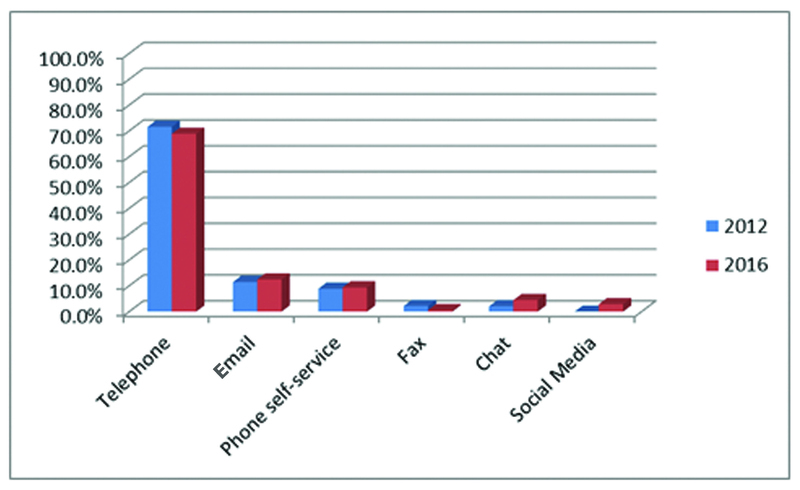 What we see is that consumers simply use more channels, and there isn’t a huge variance among channels as the following chart shows. Your customers are using all the channels you make available to them – so make sure the experience is easy, consistent, positive, and branded – across all channels. Elaine Cascio is vice president at Vanguard Communications Corp., a consulting firm specializing in customer experience, self-service, contact center processes, change management, operations, and technology.